Escape to the Blue Ridge Mountains! Here you’ll find a modern, industrial yet rustic designed cabin. With a gorgeous décor, and natural stone touches throughout, this property is aptly named “Refined Rustic”. 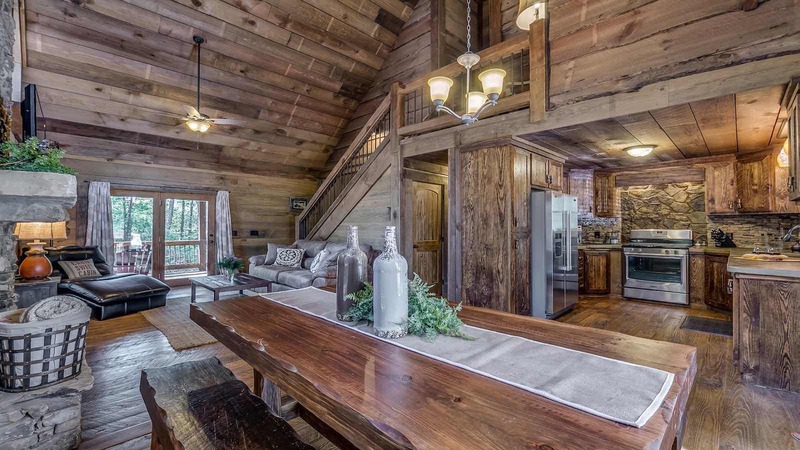 Journey to the area known as Cashes Valley in Fannin County, Georgia, where this cabin is tucked away in the hills. To get to the cabin, you'll drive the beautiful countryside while passing rolling farmland, and Adventure Trail Rides, a local horseback-riding outfitter. You'll wind along creeks and dense forests on the gentle gravel road through the mountains and hills. The scenic drive will end at your rustic oasis, and your vacation will begin! Nearing the cabin, you’ll see Refined Rustic's fire pit just in front of the driveway. The parking area offers large stone slab steps for entry to the cabin itself. Fall in love immediately with the gorgeous kitchen to your right, with its natural stone stacked backsplash, stone slab counter tops, double sinks, and stainless steel appliances. Just off the kitchen is the great room, offering a large farmhouse-style table, which is perfect for meals with abundant serving space. 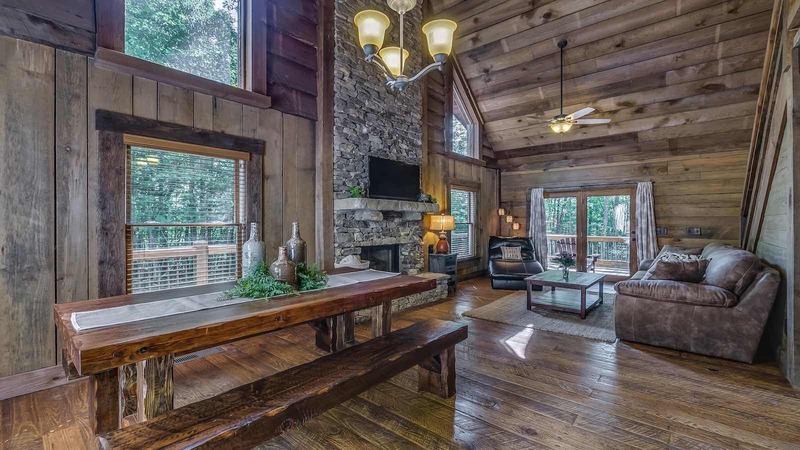 The great room boasts a huge floor-to-ceiling stone stacked, gas log fireplace, topped with a rustic mantel and flat screen TV. Around the corner is the main level bedroom. This bedroom offers a wall mounted flat screen TV that can be hidden via bi-fold doors for convenience, a King Size log bed, and French Doors that open to the wrap around deck. The main level bathroom is just beside this bedroom, which has a gorgeous copper sink in the stone counter top and includes a beautiful all-stone open shower. 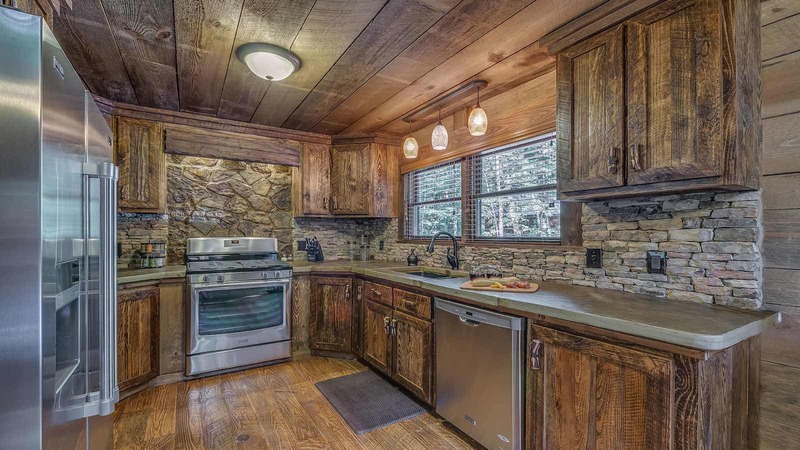 Outside this main level, you’ll find a gas grill and patio seating for enjoying the rolling mountain scenery! Stroll upstairs to find the cozy little reading nook that overlooks the great room on the upper level. The bedroom on this level has a King size log bed, a flat screen TV, and private balcony for two. The adjoining bathroom is gorgeous, composed of copper sinks, and a uniquely designed open stone shower. Now, for the real fun, head to the lower level game room! This level is perfect for entertaining because it includes a card table, pool table room, small bar nook with stools, a large flat screen television and cozy seating by the stone stacked gas log fireplace. Around the corner is the poolroom, an ideal location for a friendly game…. Or for a score to be settled! This level also has a full bathroom, complete with sliding barn door and open rock shower. Outside you will find the bubbling hot tub, which is easily accessible thru the poolroom. The hot tub is perfect for enjoying a glass of champagne, and the serene fresh mountain air. 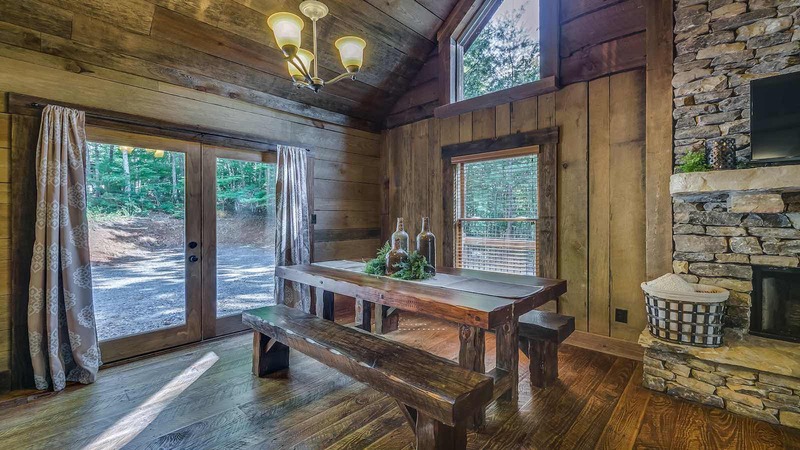 With the fire pit just a step away; Refined Rustic is the perfect cabin for couples, or even just two guests. With all of these amenities, who’d want to leave?